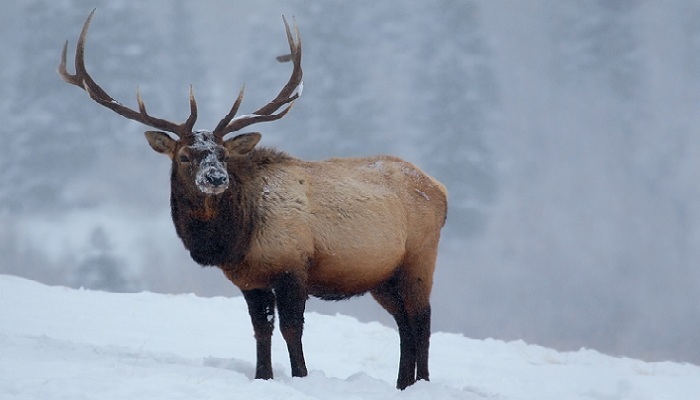 There are very few creatures as majestic yet powerful as the stag, pictured here on a snowy hillside. Impress your clients this holiday season with ECO2’s ‘Stag in Snow’ business Christmas ecards. With such an impressive head of horns, it’s easy to see why the stag is a much-loved creature. Seen here in a wintery scene, the stag is knowingly gazing across the hillside, asserting its authority and standing tall in such cold surroundings. Looking at his fur, though, you can see how he’s managing to stay warm – his brown coat is thick and strong, with a mane that flows so elegantly down from his neck. The picture is completed with the bleak winter scene we all know, as snow-covered trees are just about visible in the background. As animated snow falls, a message of your choosing can be included in the top-right corner. In addition, optional second, third and fourth pages give even more opportunity to share your corporate message this holiday season, as well as opportunities to share how many trees you’ll be planting by purchasing these corporate holiday ecards. The ‘Stag in Snow’ ecard is a true favourite amongst our customers looking for those perfect Christmas ecards for business. Send this powerful stag image this holiday season.